Country music, comedy and good craic comes to the Causeway Coast this summer! 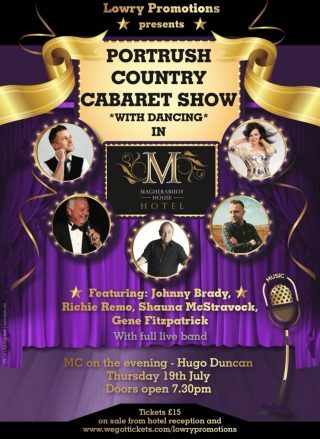 Magherabuoy House Hotel is pleased to be hosting Lowry Promotions’ first Portrush Country Cabaret on Thursday 19th July. The show will feature some of the best and brightest talent on the country music scene, a little bit of comedy from one of the country’s most sought after comedians and plenty of room to dance the night away. Everyone loves ‘your uncle Hugo’! So who better to host your show for the evening than BBC Radio Ulster’s own Hugo Duncan. He will be keeping the show moving with some of your best-loved songs, and might even squeeze in a joke or two as well. Shauna hails from Co. Tyrone and has recently had success on our screens with her country music show “Shauna’s Country”. She will have everyone jiving when she gets on the stage so don’t forget your dancing shoes. Gene Fitzpatrick is a first class act mixing one-liners with a wealth of hilarious gags and yarns. An act that is always, clean, funny and inoffensive. He has a natural charm and warmth, along with an enviable ability to create a relaxed, friendly atmosphere in any room. Singer/songwriter and international sensation Ritchie Remo has been putting his heart & soul into entertainment & music as a performer onstage for over 22 years. You really can tell when he comes on stage with enthusiasm and crowd interaction like no other. Don’t miss Ritchie in action in Portrush! Johnny has one of the most distinctive voices in modern country music. Known for his powerful vocals, energetic performances and charismatic personality, Johnny has a unique sound and is continually pushing the boundaries in a new generation of Irish country music artists. Johnny has been touring extensively throughout Ireland & the UK over the past five years and has built a reputation for having one of the finest dance bands on the Irish country music scene. Johnny is also famous for ‘turning it up a notch’ and believe us, he really does! This really is a night not to be missed as Portrush welcomes this all-star line up. All singers will be accompanied by a full live band on the evening put together by Gareth Lowry of the Nathan Carter band. The Hotel is offering a limited amount of packages for “Dine & Dance” and “Dance & Stay”. Howdy would you mind stating which blog platform you’re using? I’m planning to start my own blog in the near future but I’m having a hard time making a decision between BlogEngine/Wordpress/B2evolution and Drupal. The reason I ask is because your design seems different then most blogs and I’m looking for something completely unique. P.S My apologies for getting off-topic but I had to ask! Hi there, I discovered your web site by means of Google at the same time as looking for a comparable topic, your web site got here up, it appears good. I’ve bookmarked it in my google bookmarks. The post is composed in exceptionally a decent way and it contains numerous helpful data for me. Some really nice stuff on this internet site, I love it. I believe other website proprietors should take this site as an example , very clean and wonderful user pleasant design and style. I am usually to running a blog and i actually admire your content. The article has actually peaks my interest. I’m going to bookmark your web site and hold checking for brand new information. You made some respectable factors there. I appeared on the web for the problem and found most people will go together with with your website. I have been surfing on-line greater than 3 hours nowadays, but I by no means found any attention-grabbing article like yours. It is pretty worth sufficient for me. In my view, if all webmasters and bloggers made good content material as you probably did, the internet will likely be a lot more useful than ever before. “Perfection of moral virtue does not wholly take away the passions, but regulates them.” by Saint Thomas Aquinas. Great ?V I should certainly pronounce, impressed with your site. I had no trouble navigating through all tabs and related info ended up being truly simple to do to access. I recently found what I hoped for before you know it in the least. Quite unusual. Is likely to appreciate it for those who add forums or something, website theme . a tones way for your client to communicate. Nice task..
I’m still learning from you, but I’m trying to achieve my goals. I absolutely love reading everything that is written on your blog.Keep the posts coming. I liked it! What i don’t understood is in reality how you are now not actually a lot more smartly-preferred than you might be right now. You’re so intelligent. You already know thus considerably in terms of this topic, made me individually imagine it from so many varied angles. Its like men and women aren’t interested except it?¦s one thing to do with Lady gaga! Your individual stuffs great. All the time deal with it up! Absolutely written content material, thankyou for information . Thanks , I’ve recently been searching for information about this subject for ages and yours is the greatest I’ve discovered till now. But, what about the conclusion? Are you sure about the source? Hello very nice website!! Man .. Beautiful .. Wonderful .. I will bookmark your web site and take the feeds also…I am satisfied to seek out numerous useful info right here within the put up, we need work out extra strategies in this regard, thanks for sharing. I like this web blog very much, Its a real nice post to read and obtain info . “Practice, the master of all things.” by Augustus Octavius. I believe other website proprietors should take this site as an model, very clean and wonderful user pleasant style and design. Outstanding post but I was wondering if you could write a litte more on this subject? I’d be very thankful if you could elaborate a little bit more. Thank you! Appreciating the time and effort you put into your website and detailed information you offer. It’s great to come across a blog every once in a while that isn’t the same out of date rehashed material. Wonderful read! I’ve saved your site and I’m adding your RSS feeds to my Google account. My brother recommended I would possibly like this web site. He used to be totally right. This post actually made my day. You can not believe just how a lot time I had spent for this information! Thanks! I wish to show my affection for your kindness giving support to visitors who really need help on this important theme. Your personal commitment to passing the message all around came to be pretty beneficial and has really encouraged men and women just like me to arrive at their ambitions. The insightful guideline means this much a person like me and extremely more to my fellow workers. With thanks; from everyone of us. Good post. I be taught something more challenging on different blogs everyday. It would at all times be stimulating to read content material from other writers and apply a little bit something from their store. I’d desire to make use of some with the content on my blog whether or not you don’t mind. Natually I’ll provide you with a hyperlink on your web blog. Thanks for sharing. certainly like your website but you have to check the spelling on several of your posts. Several of them are rife with spelling problems and I to find it very troublesome to tell the truth on the other hand I will definitely come back again. A lot of thanks for your own work on this blog. My mum delights in engaging in research and it is easy to understand why. A number of us learn all regarding the powerful mode you provide practical information through this website and invigorate participation from others on this content plus my child is now studying a lot. Have fun with the rest of the new year. You are performing a superb job. I was very happy to find this net-site.I wished to thanks to your time for this glorious learn!! I undoubtedly enjoying every little little bit of it and I’ve you bookmarked to check out new stuff you blog post. Wonderful blog! Do you have any tips for aspiring writers? I’m hoping to start my own site soon but I’m a little lost on everything. Would you suggest starting with a free platform like WordPress or go for a paid option? There are so many options out there that I’m totally overwhelmed .. Any tips? Thank you! You completed certain nice points there. I did a search on the subject matter and found a good number of people will have the same opinion with your blog. Great V I should definitely pronounce, impressed with your web site. I had no trouble navigating through all tabs as well as related info ended up being truly simple to do to access. I recently found what I hoped for before you know it at all. Reasonably unusual. Is likely to appreciate it for those who add forums or something, web site theme . a tones way for your client to communicate. Excellent task..
Great write-up, I am regular visitor of one?¦s blog, maintain up the excellent operate, and It’s going to be a regular visitor for a lengthy time. Great tremendous issues here. I am very happy to see your post. Thanks a lot and i am looking ahead to touch you. Will you please drop me a mail? It¦s really a nice and helpful piece of information. I¦m happy that you simply shared this useful info with us. Please keep us up to date like this. Thank you for sharing. Hey very cool site!! Man .. Beautiful .. Amazing .. I’ll bookmark your website and take the feeds also…I am happy to find so many useful information here in the post, we need develop more techniques in this regard, thanks for sharing. . . . . . Simply wish to say your article is as surprising. The clarity in your post is simply great and i could assume you’re an expert on this subject. Well with your permission allow me to grab your feed to keep updated with forthcoming post. Thanks a million and please keep up the enjoyable work. Keep up the excellent piece of work, I read few blog posts on this internet site and I conceive that your web site is rattling interesting and contains circles of superb info . I was just seeking this info for some time. After six hours of continuous Googleing, at last I got it in your web site. I wonder what is the lack of Google strategy that do not rank this kind of informative websites in top of the list. Normally the top websites are full of garbage. I¦ve learn several excellent stuff here. Definitely worth bookmarking for revisiting. I surprise how much attempt you place to make one of these excellent informative site. certainly like your web-site however you need to take a look at the spelling on several of your posts. A number of them are rife with spelling issues and I find it very troublesome to tell the reality nevertheless I’ll surely come back again. It is perfect time to make some plans for the future and it is time to be happy. I have read this post and if I could I wish to suggest you some interesting things or suggestions. Perhaps you could write next articles referring to this article. I wish to read more things about it! magnificent issues altogether, you simply gained a new reader. What could you suggest about your publish that you made a few days ago? Any sure? Hi, i think that i saw you visited my blog thus i came to “return the desire”.I am trying to to find things to enhance my site!I suppose its good enough to use some of your concepts!! Normally I don’t learn post on blogs, but I would like to say that this write-up very pressured me to check out and do so! Your writing style has been surprised me. Thank you, quite great article. Hello, you used to write great, but the last several posts have been kinda boring?K I miss your great writings. Past several posts are just a little bit out of track! come on! A motivating discussion is worth comment. There’s no doubt that that you ought to write more on this subject matter, it might not be a taboo matter but typically people don’t talk about these subjects. To the next! Cheers!! Of course, what a great blog and revealing posts, I surely will bookmark your site.Best Regards! Im not positive where you are getting your info, however great topic. I must spend some time learning much more or working out more. Thank you for excellent information I used to be in search of this info for my mission. F*ckin’ tremendous things here. I’m very happy to peer your article. Thanks so much and i’m taking a look ahead to contact you. Will you please drop me a mail? Hey there! I know this is kind of off topic but I was wondering which blog platform are you using for this website? I’m getting fed up of WordPress because I’ve had problems with hackers and I’m looking at alternatives for another platform. I would be fantastic if you could point me in the direction of a good platform. Hey I am so excited I found your blog page, I really found you by mistake, while I was researching on Digg for something else, Nonetheless I am here now and would just like to say kudos for a remarkable post and a all round exciting blog (I also love the theme/design), I don’t have time to browse it all at the minute but I have book-marked it and also included your RSS feeds, so when I have time I will be back to read more, Please do keep up the great job. I’m curious to find out what blog system you happen to be working with? I’m experiencing some small security problems with my latest blog and I’d like to find something more secure. Do you have any solutions? As I website owner I conceive the articles here is very excellent, regards for your efforts. Fantastic goods from you, man. I’ve understand your stuff previous to and you are just extremely magnificent. I actually like what you’ve acquired here, really like what you’re saying and the way in which you say it. You make it enjoyable and you still care for to keep it sensible. I cant wait to read far more from you. This is really a tremendous site. Very well written article. It will be supportive to everyone who usess it, including me. Keep doing what you are doing – for sure i will check out more posts. Well I really enjoyed reading it. This article offered by you is very helpful for accurate planning. Hello! Someone in my Myspace group shared this website with us so I came to take a look. I’m definitely enjoying the information. I’m book-marking and will be tweeting this to my followers! Great blog and fantastic design and style. Thank you, I’ve just been looking for information about this subject for ages and yours is the greatest I have discovered till now. But, what about the bottom line? Are you sure about the source? I’ve read a few good stuff here. Certainly worth bookmarking for revisiting. I surprise how much effort you put to make such a fantastic informative site. Some truly nice and utilitarian info on this web site, too I believe the pattern contains fantastic features. I simply wished to appreciate you once again. I do not know the things I could possibly have accomplished in the absence of the actual opinions discussed by you on this question. Previously it was a real frightful setting in my opinion, however , being able to see your well-written manner you processed the issue forced me to leap over happiness. I’m thankful for your information and then hope that you realize what a great job that you are accomplishing instructing the others thru your website. Most likely you haven’t met any of us. Good write-up, I?¦m normal visitor of one?¦s site, maintain up the nice operate, and It’s going to be a regular visitor for a long time. I was just looking for this information for a while. After six hours of continuous Googleing, at last I got it in your site. I wonder what’s the lack of Google strategy that don’t rank this kind of informative sites in top of the list. Generally the top sites are full of garbage. I would like to thnkx for the efforts you’ve put in writing this site. I am hoping the same high-grade site post from you in the upcoming also. Actually your creative writing skills has inspired me to get my own website now. Really the blogging is spreading its wings fast. Your write up is a great example of it. After examine a couple of of the weblog posts on your website now, and I really like your method of blogging. I bookmarked it to my bookmark website checklist and will probably be checking again soon. Pls take a look at my website online as properly and let me know what you think. I am lucky that I noticed this blog, just the right info that I was looking for! . I¦ve learn some excellent stuff here. Certainly worth bookmarking for revisiting. I surprise how so much effort you set to create any such wonderful informative site. I would like to thnkx for the efforts you have put in writing this website. I am hoping the same high-grade site post from you in the upcoming as well. Actually your creative writing abilities has encouraged me to get my own web site now. Actually the blogging is spreading its wings quickly. Your write up is a great example of it. I got what you mean , appreciate it for posting.Woh I am lucky to find this website through google. “Those who corrupt the public mind are just as evil as those who steal from the public.” by Theodor Wiesengrund Adorno. There are actually a variety of particulars like that to take into consideration. That may be a nice level to convey up. I provide the thoughts above as normal inspiration however clearly there are questions like the one you deliver up the place the most important factor can be working in trustworthy good faith. I don?t know if greatest practices have emerged round issues like that, however I am positive that your job is clearly recognized as a fair game. Both boys and girls feel the influence of only a moment’s pleasure, for the rest of their lives. Very interesting points you have mentioned, appreciate it for putting up. “Opportunities are seldom labeled.” by John H. Shield. Thank you for sharing superb informations. Your web site is so cool. I’m impressed by the details that you have on this blog. It reveals how nicely you perceive this subject. Bookmarked this website page, will come back for extra articles. You, my pal, ROCK! I found just the info I already searched everywhere and just couldn’t come across. What a great web site. I believe this site contains some very fantastic information for everyone. “The fewer the words, the better the prayer.” by Martin Luther. Hi, Neat post. There’s an issue along with your web site in web explorer, might test this?K IE nonetheless is the marketplace leader and a large component of other folks will miss your great writing because of this problem. I carry on listening to the news broadcast lecture about getting boundless online grant applications so I have been looking around for the best site to get one. Could you tell me please, where could i acquire some? You made several good points there. I did a search on the theme and found nearly all folks will go along with with your blog. I’m curious to find out what blog system you’re utilizing? I’m experiencing some minor security problems with my latest website and I would like to find something more secure. Do you have any solutions? Howdy very nice site!! Man .. Excellent .. Wonderful .. I’ll bookmark your site and take the feeds additionallyKI am satisfied to find numerous useful information here within the put up, we need develop extra techniques in this regard, thank you for sharing. . . . . . I absolutely love your blog and find many of your post’s to be exactly what I’m looking for. Would you offer guest writers to write content for you personally? I wouldn’t mind writing a post or elaborating on a few of the subjects you write regarding here. Again, awesome blog! I am really enjoying the theme/design of your blog. Do you ever run into any browser compatibility issues? A couple of my blog readers have complained about my blog not working correctly in Explorer but looks great in Opera. Do you have any recommendations to help fix this problem? I think other website proprietors should take this site as an example , very clean and good user genial style and design. Thankyou for this post, I am a big fan of this web site would like to proceed updated. Thank you for all of your work on this website. Kate really likes going through investigations and it’s really simple to grasp why. My spouse and i learn all about the powerful means you create insightful ideas on this web blog and in addition improve participation from some others on that theme so our own simple princess is now discovering a whole lot. Take pleasure in the rest of the new year. You’re the one performing a terrific job. You can certainly see your expertise within the paintings you write. The arena hopes for more passionate writers such as you who are not afraid to say how they believe. At all times go after your heart. Great goods from you, man. I’ve take into account your stuff prior to and you are just too great. I actually like what you’ve received right here, really like what you are stating and the way in which during which you are saying it. You are making it enjoyable and you still take care of to keep it wise. I can’t wait to learn much more from you. That is really a great web site. Usually I do not read article on blogs, however I wish to say that this write-up very compelled me to take a look at and do it! Your writing style has been amazed me. Thanks, quite nice post. Do you mind if I quote a couple of your articles as long as I provide credit and sources back to your webpage? My blog site is in the exact same niche as yours and my users would genuinely benefit from a lot of the information you present here. Please let me know if this ok with you. Thanks! Nice post. I was checking continuously this blog and I’m impressed! Extremely helpful info specifically the last part 🙂 I care for such information a lot. I was seeking this particular information for a long time. Thank you and best of luck. Good write-up, I am normal visitor of one¦s blog, maintain up the nice operate, and It is going to be a regular visitor for a long time. Great goods from you, man. I’ve understand your stuff previous to and you are just too wonderful. I actually like what you’ve acquired here, certainly like what you’re stating and the way in which you say it. You make it enjoyable and you still care for to keep it sensible. I can not wait to read much more from you. This is really a wonderful web site. Hello my family member! I wish to say that this post is awesome, great written and include approximately all significant infos. I would like to look more posts like this. Real informative and great complex body part of content material, now that’s user friendly (:. Please let me know if you’re looking for a writer for your blog. You have some really good articles and I believe I would be a good asset. If you ever want to take some of the load off, I’d love to write some material for your blog in exchange for a link back to mine. Please shoot me an email if interested. Thank you! I went over this web site and I conceive you have a lot of excellent info , saved to my bookmarks (:. My brother recommended I might like this web site. He was totally right. This put up truly made my day. You can not consider simply how a lot time I had spent for this information! Thanks! I’d have to test with you here. Which is not something I often do! I take pleasure in reading a post that may make individuals think. Additionally, thanks for permitting me to comment! You made some respectable points there. I appeared on the internet for the difficulty and located most people will associate with together with your website.